A quick little head’s up today: I’m going to be teaching a class at the Sewing Summit in Salt Lake City in September! 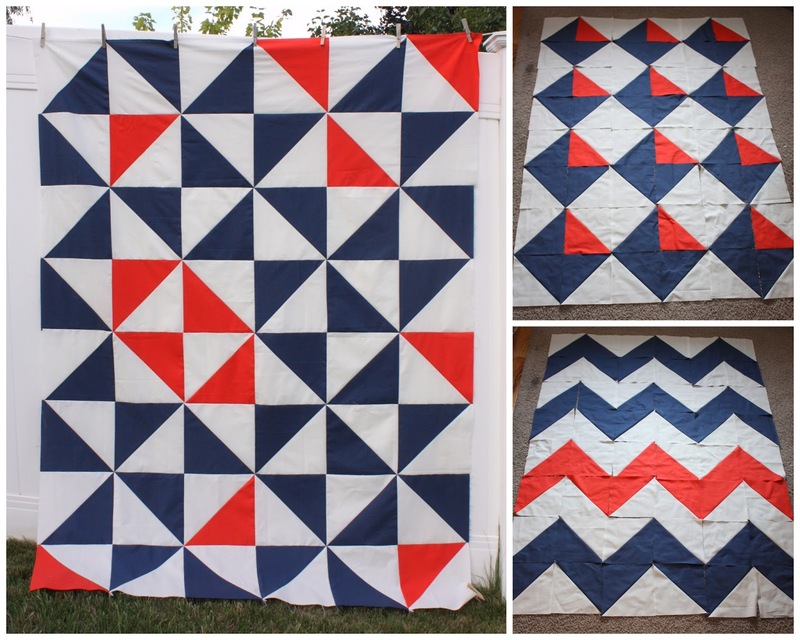 I’ll be teaching a class where we’ll make a super-easy quilt top and finish it in class! There are lots of options for the design, so you’ll be able to personalize it and make it your own. I’ve had fun playing with the design for this project. In other news, I’m hoping to catch-up on my Virtual Quilting Bee blocks before we get Block #11 tomorrow. I’ve fallen behind a tiny bit this summer, but I’m planning to get back on track this weekend. In case this happened to you too, when making Block 10 my block ended up small, but one simple fix worked. Instead of cutting my corner triangles from two 2 7/8″ blocks, I cut two 3 1/8″ squares and cut them on the diagonal. Voila. My block was bigger. If this one, or any of your blocks, end up smaller than 8 1/2″ unfinished, don’t panic. The layout for this quilt will solve any block sizing woes. I also finished a few more scrappy-trip-along blocks, this time Christmas ones for a bee-swap for Sherri. Any little bit of sewing finishes count, right? Finished Block of the Month Quilt! the sewing summit sounds so fun! Your red white and blue blocks are all so cute! You are going to be a great addition to the summit. Nice bee blocks too!!! My mom just moved into a new house and the whole basement has orange carpet! It&#39;s way too much to replace, so I&#39;m thinking of making an orange and navy quilt for one of the guest bedrooms to try and give it a touch of modernity. 😉 Your blocks look great and the colors make me want to start! I love your scrappy-trip-along blocks using the Christmas prints. Teaching… How exciting! Lucky students!!!! I really like the different layouts. Bee blocks look beautiful! Yay Sewing Summit! It would be great to meet you there, congrats on the teaching gig! I&#39;m sure it&#39;ll be an incredible class. I can&#39;t wait to see what all of the offered classes are this year. Thanks for the sneak peek. Great advice on block #10. I had to do the same thing! We are getting closer and closer to a finished project. I can&#39;t wait to see it all come together! Oh I&#39;m still sad that I won&#39;t be at Sewing Summit this year. All of my savings to attend went to buy my long arm machine. Next year for sure.